Hello lovely ladies and HAPPY NEW YEAR !!!!!!!!! I’m finally back in my crafty den after three weeks working flat-out in my shop for the Christmas holidays. I really missed you all and your crafty endeavors and hopefully I can now start to catch up . Over at Get Creative we have our first card challenge of the new year and our lovely leader Irini is asking us to make a new years card. I had a little problem as the Christmas spirit just didn’t visit me this year not even in the alcoholic form. Mr P and I are still trying to fight off a nasty flu virus which has firmly attached itself to both of us and refuses to budge ! Needless to say Christmas lunch which I cooked for 12 was left untouched by myself and as soon as it was served I retreated to my bed and then a repeat performance occurred for new year !! As you will see my card apart from having the number 13 isn’t a typical new years card but I wanted to demonstrate growth, colour and nature and new beginnings and it you believe that you will believe anything ! Despite everything I really enjoyed making this card and loved the outcome which is a rare thing indeed for me, I can count on the fingers of one hand how many of my cards I really like, so here it is and hope you like it too ! The image was created using my clever Cameo and then coloured with Copic markers this is about my 5th attempt as I kept messing up the colouring.. Glossy Accents added to the red and lots of tiny seed beads on the centre of the flower and attached to a beautiful Spellbinders frame . I die cut the numbers several times and layered them to give depth, crackle paint and Copics of various colours added and topped of with crackle accents. The side panels are also Spellbinders am getting slightly addicted to them and although I love my Cameo you just cant beat the embossing that you can achieve with these dies. I do hope you will find time to play along with us at Get Creative the rest of the design team have created some beautiful cards to inspire you all . We are being sponsored this month by Enjoy Scrapping who will be offering a mystery prize, we also have two guest designers this month the lovely and talented Erina, and Aliki both of whom are not only very talented but two of the nicest people you could ever wish to meet. Morning Marie – so sorry to hear that you and Mr P have been so unwell. How heroic of you to cook Christmas lunch for 12 before retreating to bed……hope they appreciated it! 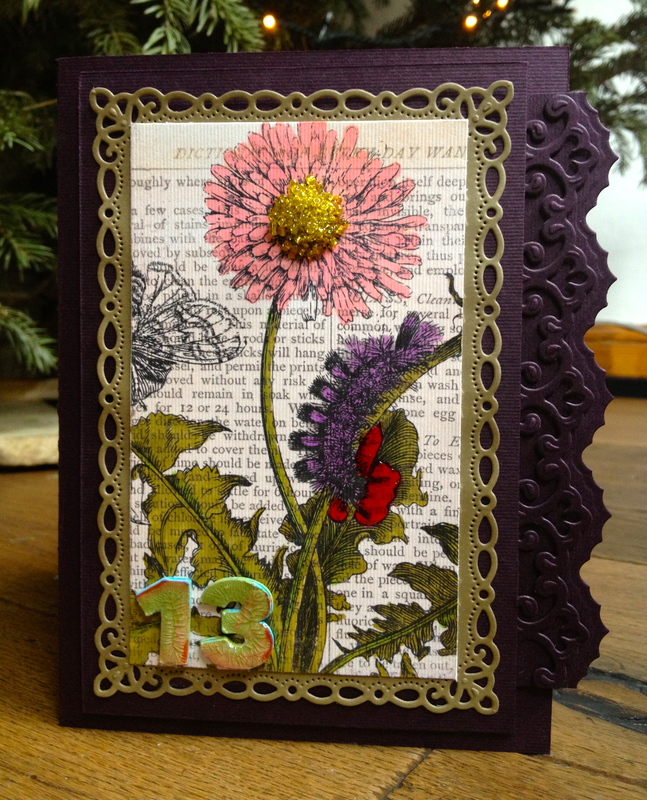 I adore your card – so different but amazing and I love how you’ve stacked the numbers to give such dimension. Presume you’re using your eBosser for the spellbinders??? Still waiting to hear how you’re getting on with your other new playthings…..? wonderful card Marie love the colors…so sorry to hear that you were sick…i hope you feeling better now! !thanks a lot for the honor to mention me to your blog!!!!! !You know that i adore you?? ?Your are the most funny cool and sweet girl that i know!!!! !i hope see you again soon!!!! Hugs and kisses Erina!!! So sorry to read that you were ill. Hope the rest of year you will better to you. Your card looks fantastic, love every detail. I wish you all the best for the new year and no more cold and flue for you! This card is so adorabale love it love it love it! Aw! poor you and Mr P, my DH was ill as well and has just got over it after 4 weeks of coughing, hope yours doesn’t last so long. Me? always fit (cross fingers). Your card is really beautiful, love the embossing and the colours, Stunning in fact. Hope 2013 is better than last year for you all. Creative take on New Year with the symbols for growth and 13 instead of 2013, striking to say the least. Still take care of yourself with that awful virus you had. Beautiful card to start the year. Hope you are feeling better soon and that 2013 will be a good year for you all. Wow! This is amazing! Here’s to great health for 2013! Gorgeous card marie! Happy new year to you and your family. This is a stunner, Marie – love the colours you chose – and again – it surprised me! Love that! Happy New Year to you too Marie, not by a long chalk was it my best Christmas either and New Years Eve was traumatic too. Brilliant creation, your talents are wasted, such a daring mix of colours that go so very well together. Hi Marie – so it was YOU who gave me that flu then! Before Christmas and during Christmas – poorly sick……and it was YOU!!!! Phew its awful isnt it and I hope that you and Mr P are feeling tip top very soon, it really knocked us for six though I must admit. αγαπητη Marie τι να πρωτοπω;καταρχην καλη χρονια σου ευχομαι!! !μαι χρονια με υγεια και πολλες δημιουργιες!οσο για την καρτα σου….ειναι ΑΠΑΙΧΤΗ!! Hi Marie, I haven’t visited in quite a while. I also love your beautiful card that you colored with Copics.. Wow! Two questions: aren’t you the Dolly from Greece? and Doesn’t Greece celebrate Christmas tomorrow? If so, Merry Christmas again! Marie, first of all I wish you and your family a very happy New Year, with lots and lots of happy moments, creativity… and above all health! I do hope you both recover soon, I guess the Christmas crazy working hours don’t help either! Your card is S-T-U-N-N-I-N-G!!! I love-love-love how you combine different elements and make such a good use of your tools. The colouring is simply amazing! Looking forward to your great creations in 2013! Happy New Year Marie!I wish you all the best!Your card is once again amazing!And I sbsolutely love that it isn’t the typical new years card!Love every detail!Hugs and kisses! Happy New Year Marie. Your card is beautiful, I love it. Aww, Marie, I’m so sorry to hear you were both ill! Hope you’re much better now. What can I say about this card other than it’s STUNNING!! I love the rich colours and fabulous detail. Look forward to all your 2013 creations! Your card is stunning, Marie. I’m sure I have commented on this beauty before. But it may have been via my iPad, and I have had problems commenting with this before. Anyhow, back to your card, which as I said before is stunning! Your colouring is beautiful, and I adore the image…..gorgeous! Sorry to hear that your Christmas was not a good one. I hope you and hubby are feeling much better now. Hi Marie, and a Happy New Year to you too. I hope by this time you (and Mr P) are starting to feel a little better? Your card is absolutely stunning, I love it, and the colours are so gorgeous. Found it, found it!!!! Truly amazing. Really, really love this. happy new year to you! wowee is that ever an amazing and beautiful card. you always impress! I love this card of yours, you’ve used very beautiful colours which are perfectly combined with each other!